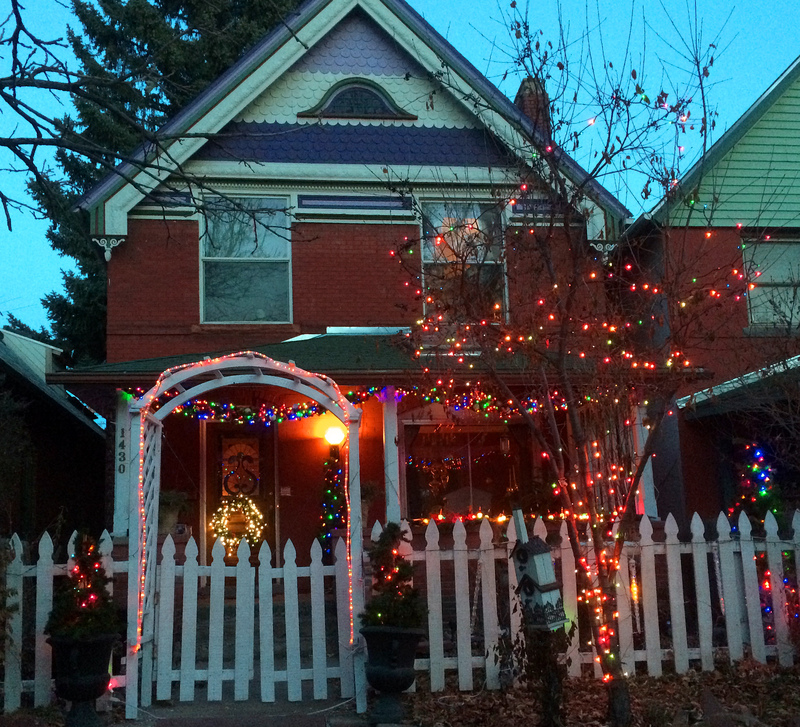 Holiday Decorating 2014, Part 4 of 4…Outside…It’s a Multi-Colored Good-Time Christmas, on a Serious Budget. 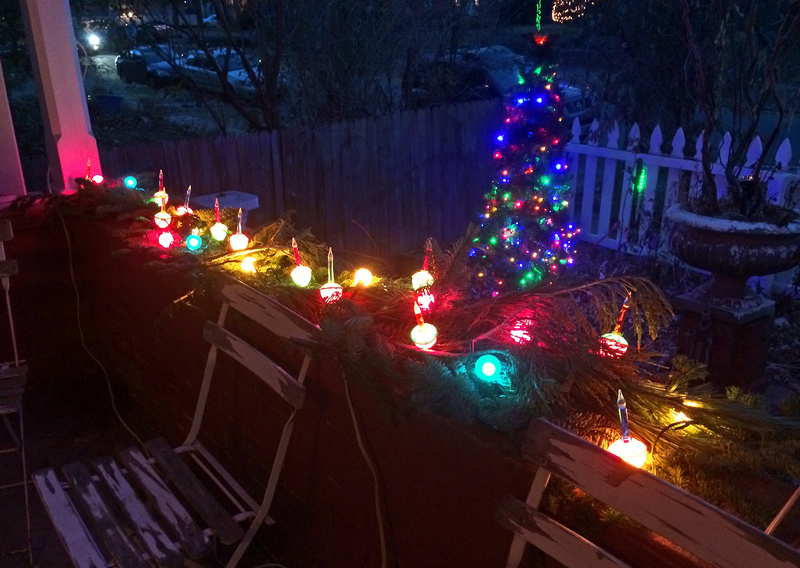 Here it is Part 4 of the 4-part Holiday 2014 Decorating Series…Outside! Firstly, allow me to apologize for the picture quality. I use my iPhone and it just takes crappy low-light pics. Below are pictures taken both a dusk and after dark. Next up, the 2014 Holiday Video! Happy Holidays people! 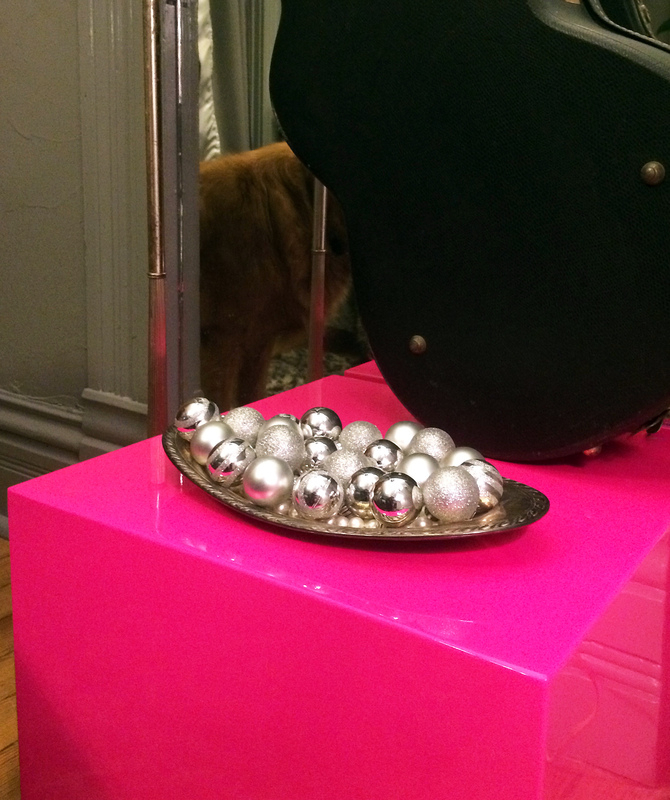 It’s time for the third installment of the 2014 Holiday Decor, Other Spaces! 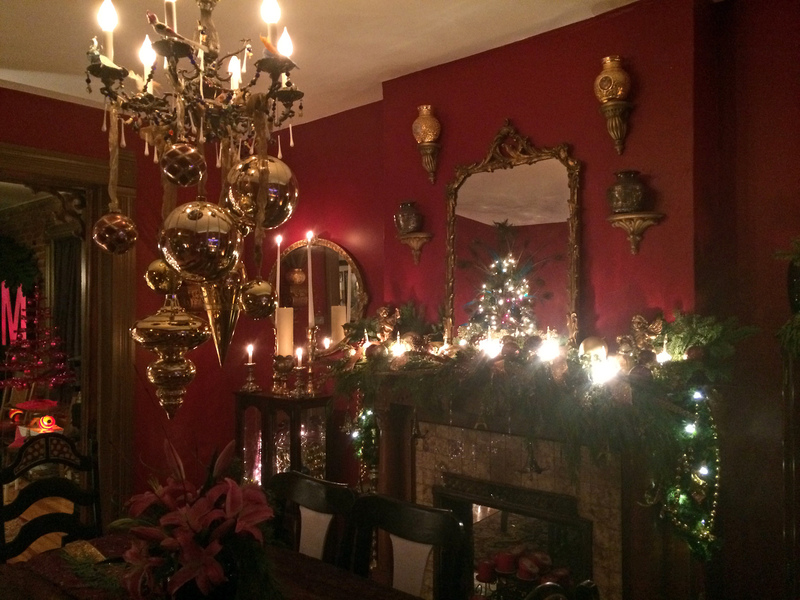 In Part 1 & Part 2 you saw the entry and main room, now for those little touches of the holiday season in other rooms of the house. 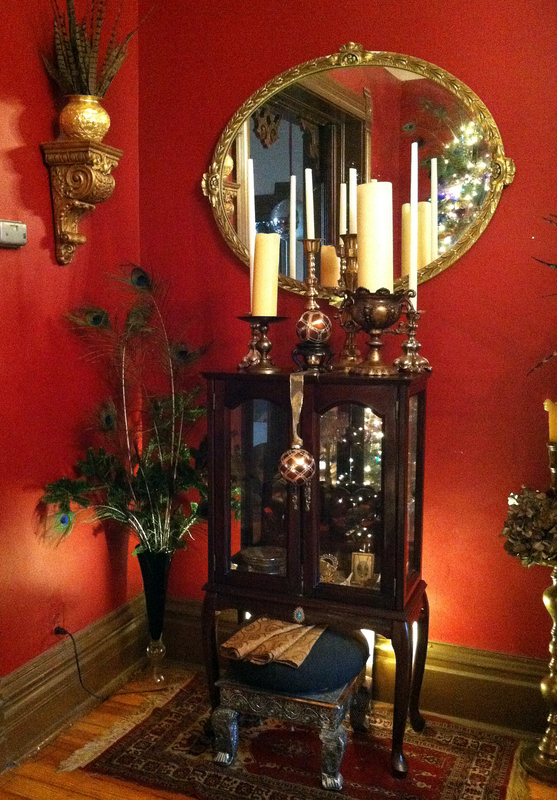 I like to have just a little Holiday touch in the bedroom for us to enjoy. This is new (well, recycled) this year. All the bits were on a little fake white tree I’d had for years that just wasn’t looking so hot anymore, so I took all of the bits off and tossed the tree. 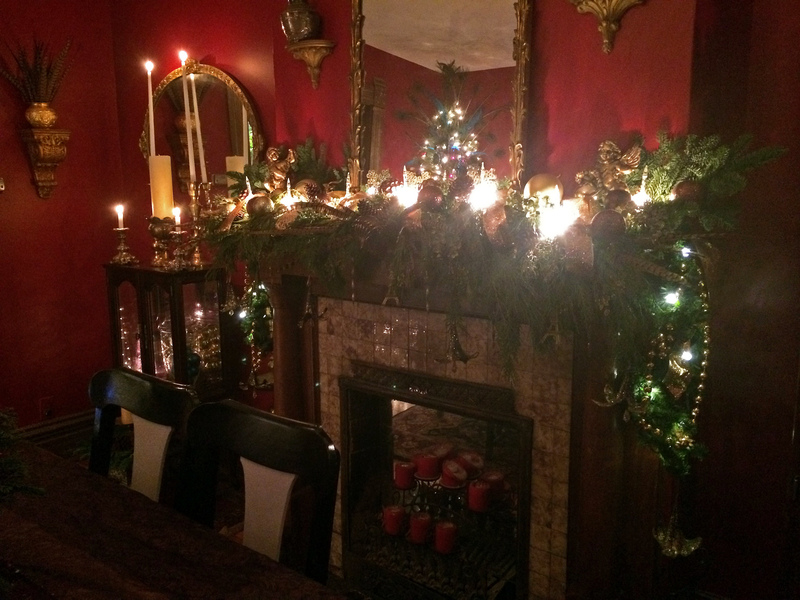 I strung up the sparkly garland over the mirror and hung some of the ornaments from that, and put all the round ornaments in a silver dish. It’s subtle and elegant and suits the bedroom well. 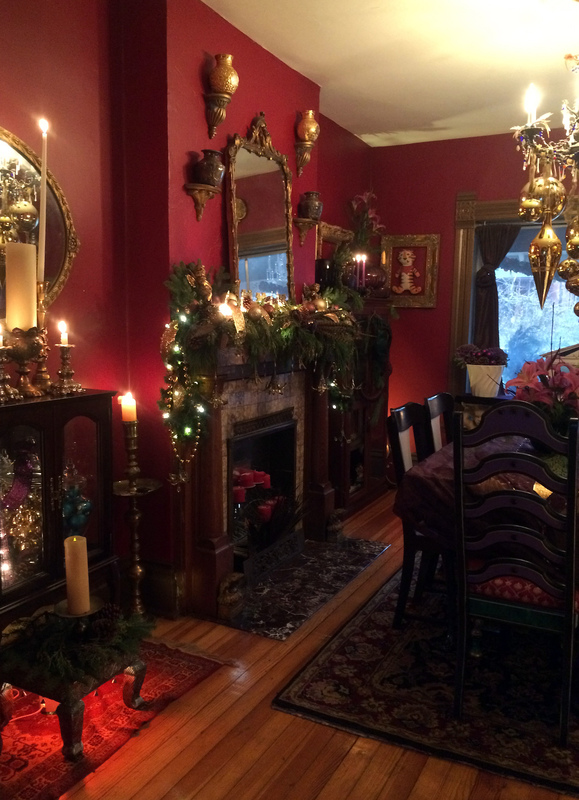 Elegant, Unique, and Sorta Victorian Holiday Decorating, Part 2, Christmas in the Main Room. 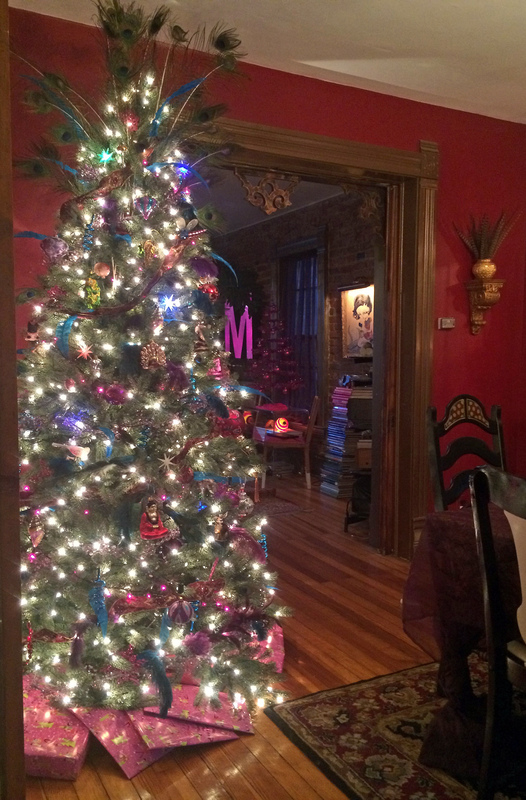 Welcome to Part 2 of my yearly Holiday Decorating series, the Main Room! This is the room we go all-out in. 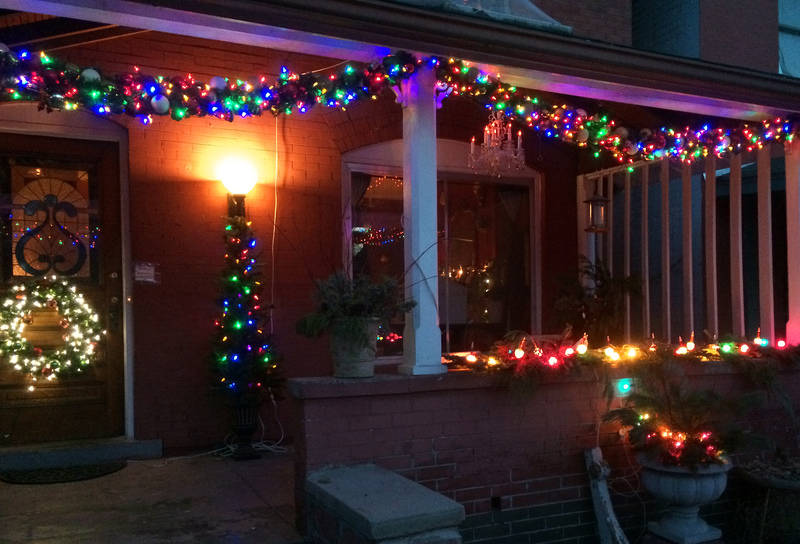 It’s in the front of the house and can be seen from the sidewalk, and is where we wind up doing the majority of the entertaining, so it’s where most of the madness happens for every holiday. I really didn’t add anything new, just a couple odds and ends I picked up at the thrift store since last season and some new glittered ribbons. If anything I actually toned it down a bit from last year. 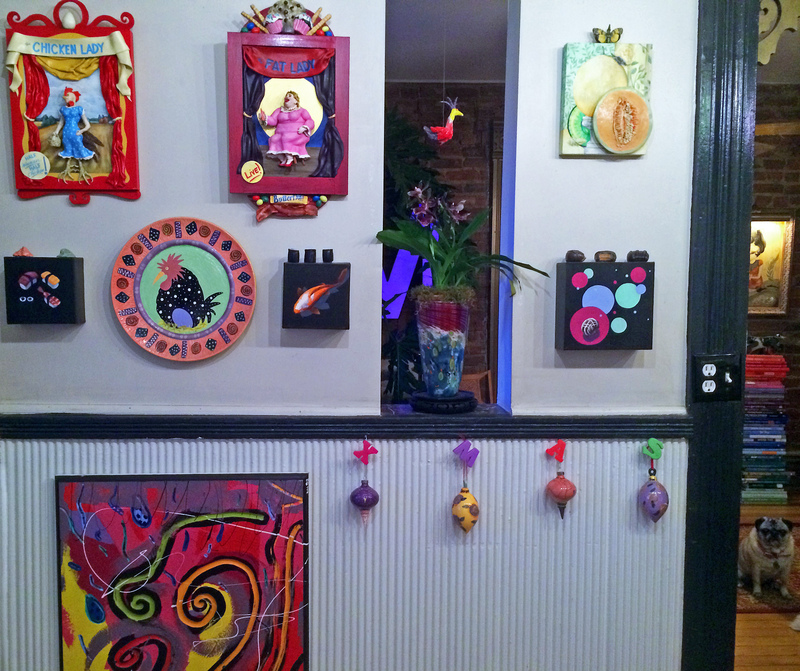 I do like to change it up a bit every year, using things in different spaces and in different ways, leaving some things in storage, and finding new goodies from my “stash” of supplies to add to the mix. Moving things around is the key to keeping it fresh and fun. Coming into the main room from the entry. To the right as you walk in the room. 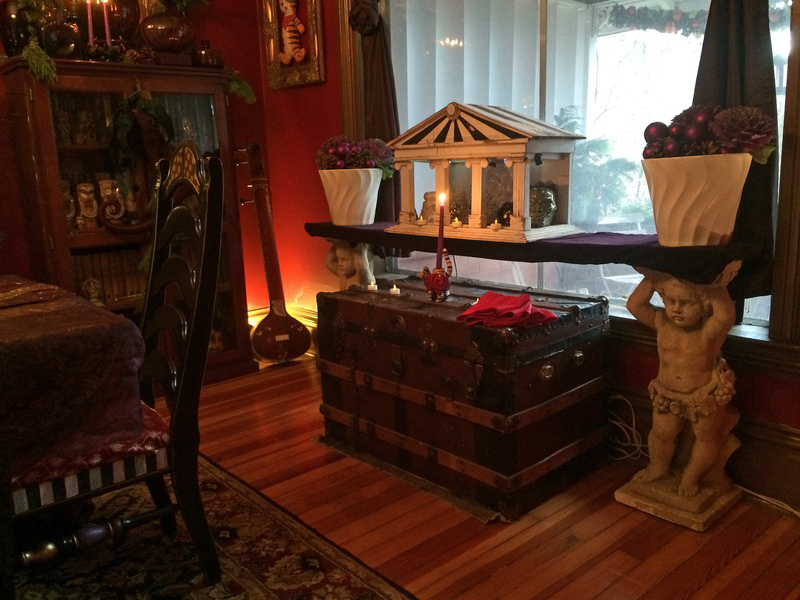 I kept it simple here, using the ornamental cabbage I already had in the white pots for Thanksgiving and adding in my old pine cones and purple balls. Nothing fancy, everything is just sitting in the pot. 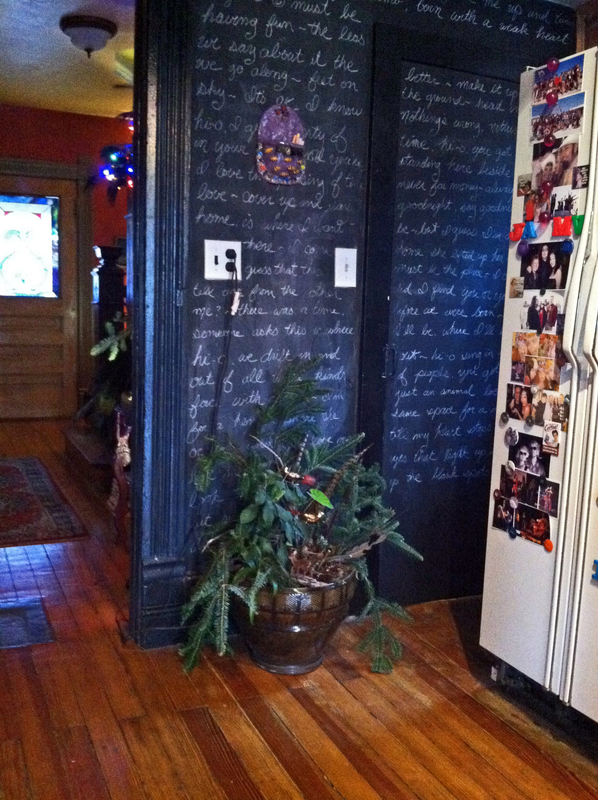 Going counter-clockwise around the room, next comes the bookcase. 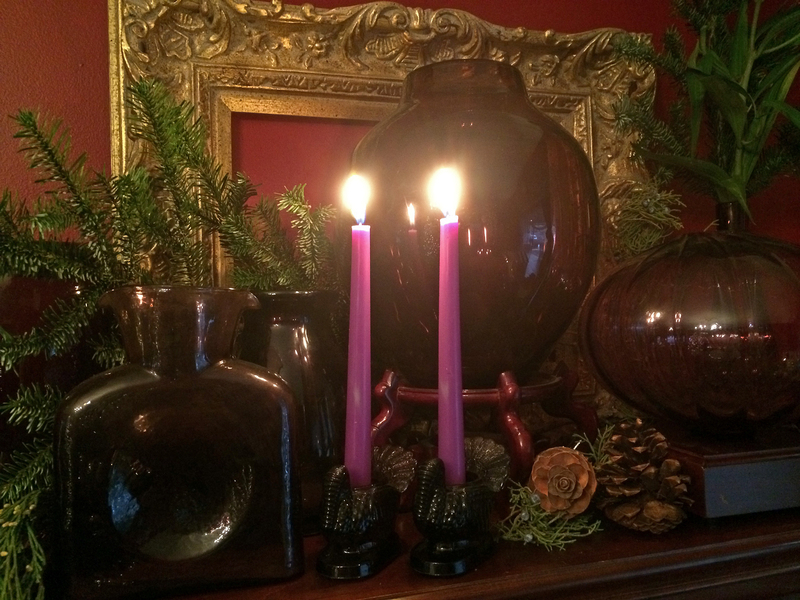 I simply added some pine boughs to the purple glass vase collection that live there most of the year as well as a couple candles. 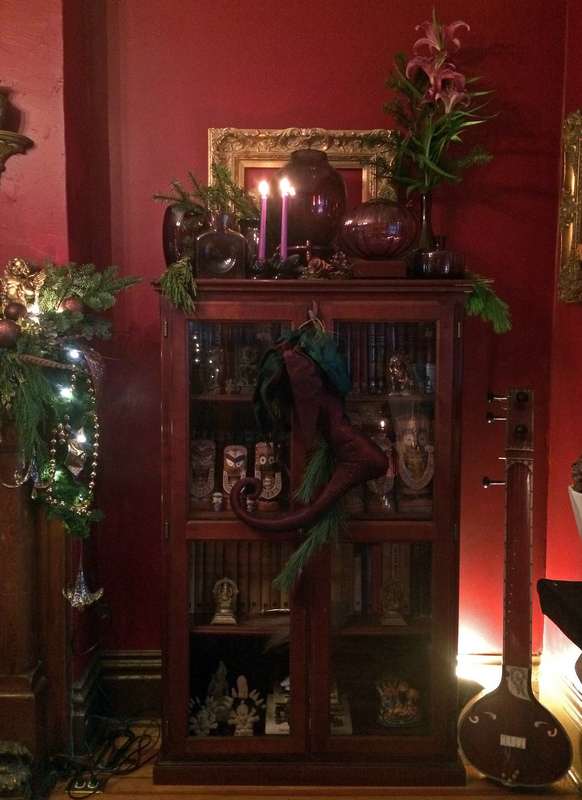 I hung our stocking (it’s just the two of us big kids so we share one) on the book shelve this year, and put a pine branch behind it. I still love this wacky stocking. I found it years ago at the thrift store. 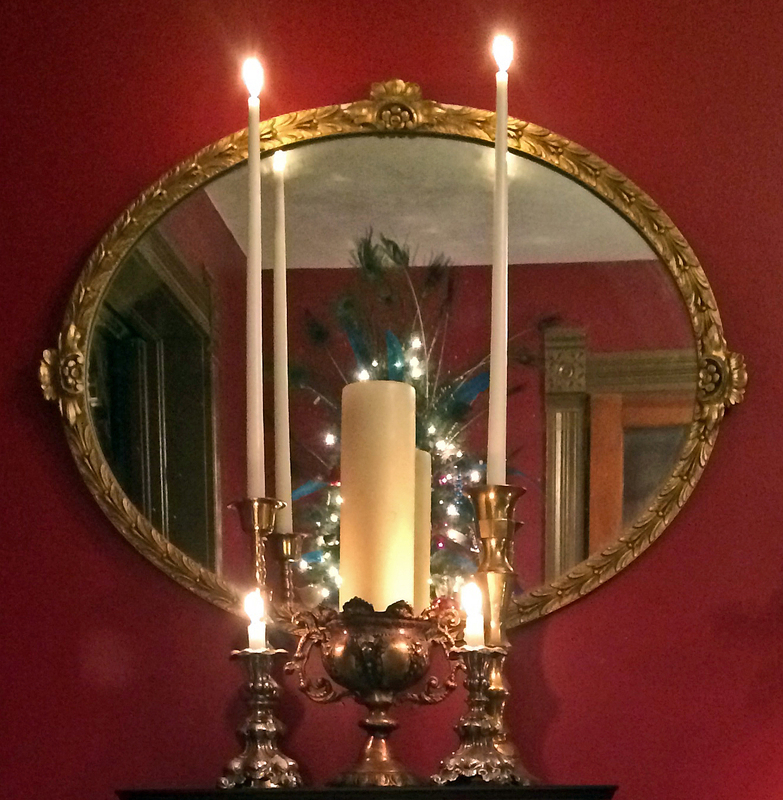 Next comes the mantle. It is very similar to last year, just toned down a bit. 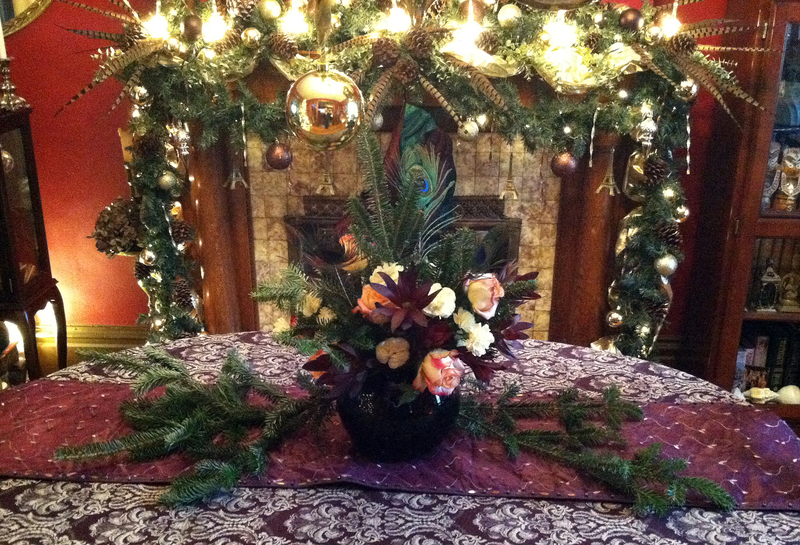 I used fresh mixed pine boughs instead of the faux garland and added in a new gold glitter ribbon. It has an Old World feel that I really like. 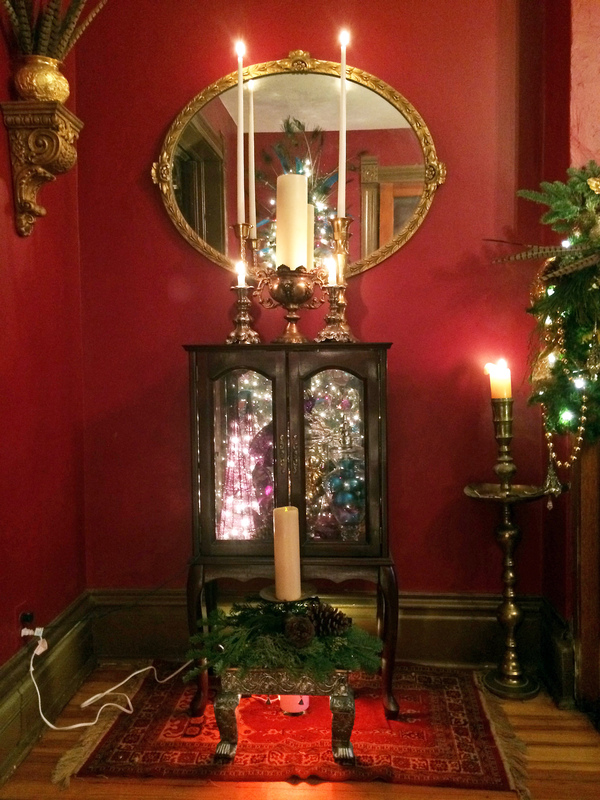 Display case to the left of the mantle. 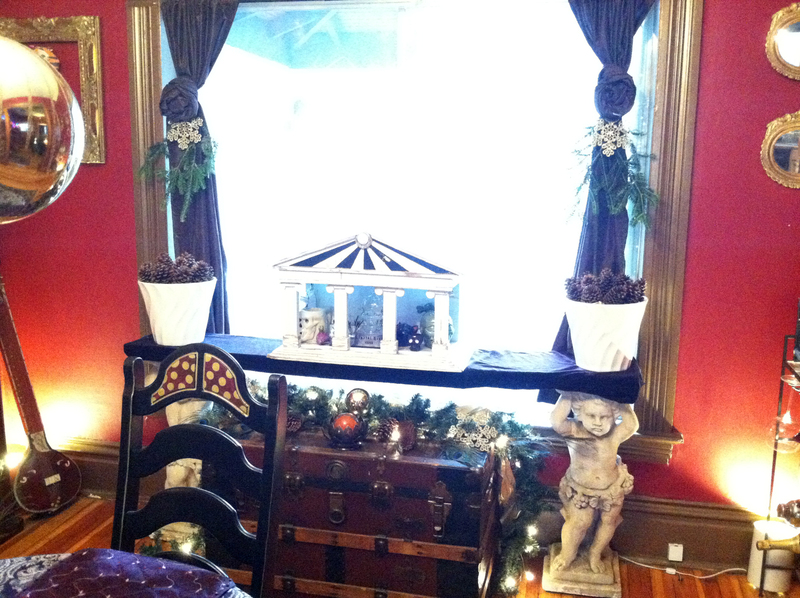 I had some fun creating a little vignette in the display case to the left of the mantle. 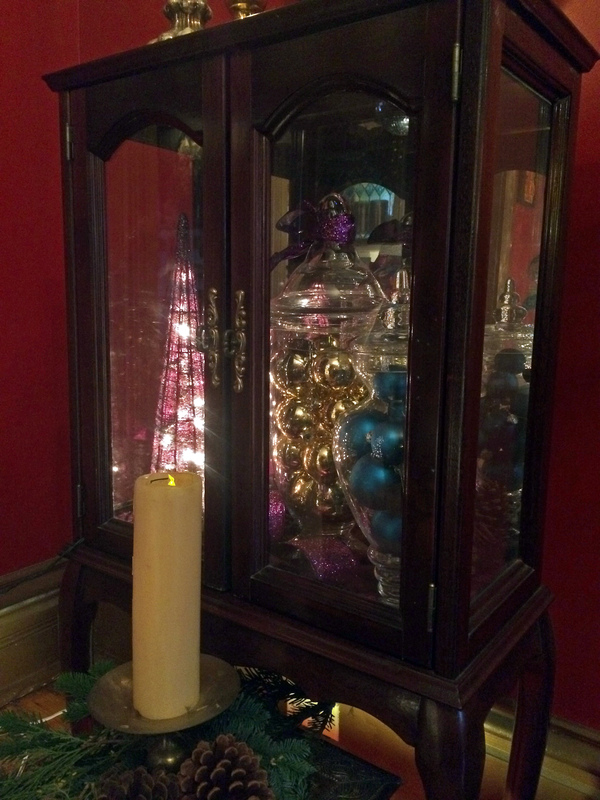 I put monochromatic ornaments in the glass jars (the same ones that had candy in them for Halloween) and added a little purple light-up tree from the thrift store, some purple glittered ribbon, and a few pine cones. 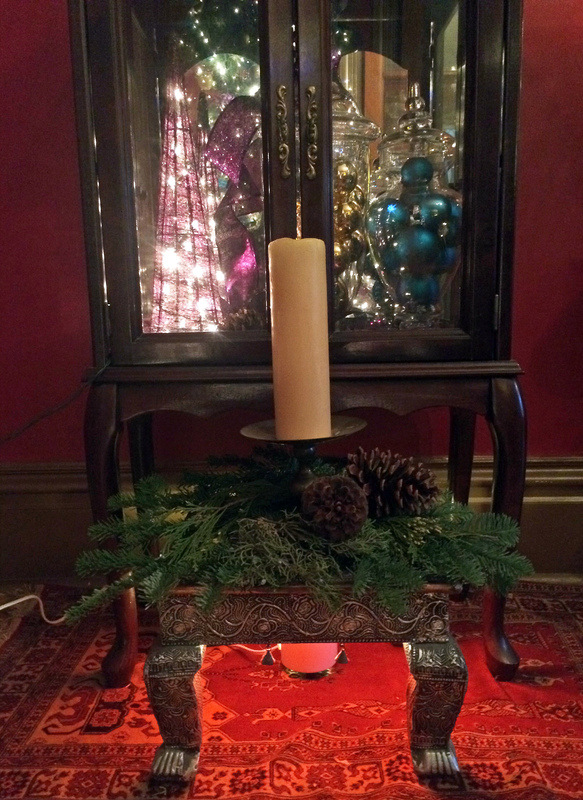 I also added some fresh pine greens and cones around the candle on the little stool in front of the case. Next comes the tree. Again, it is very similar to last year, just toned down a bit. 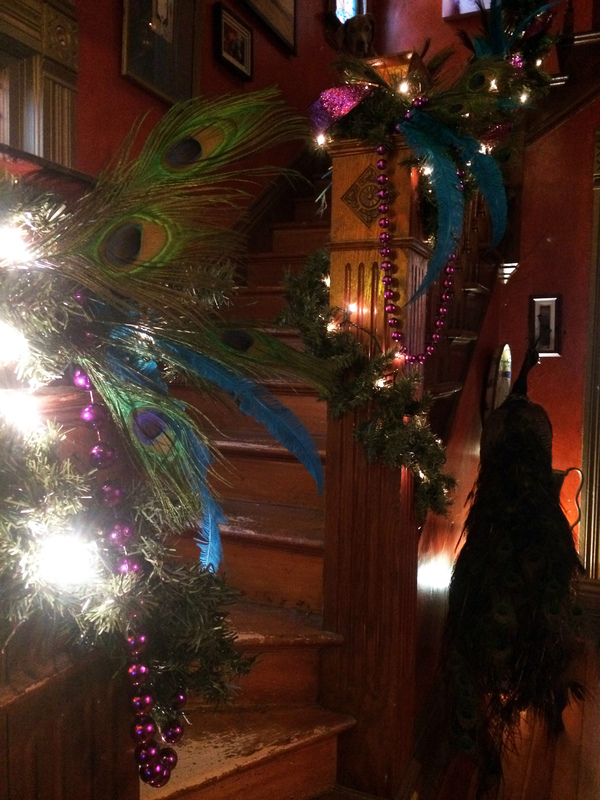 The one new addition is the teal ostrich feathers (the same ones I used on the stairs.) 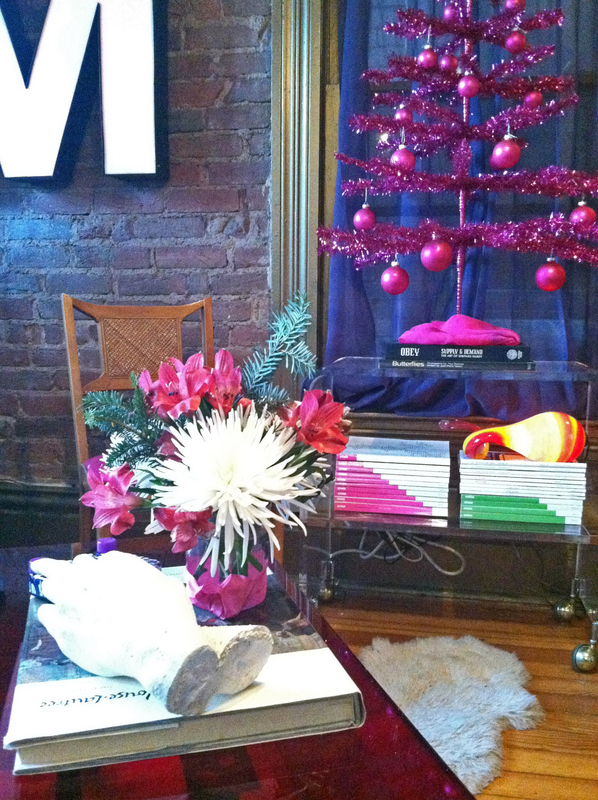 I still love our Bohemian India-Asia themed tree with all it’s feathers and unusual ornaments. I do want to get more of the glittered ribbon to add to it. 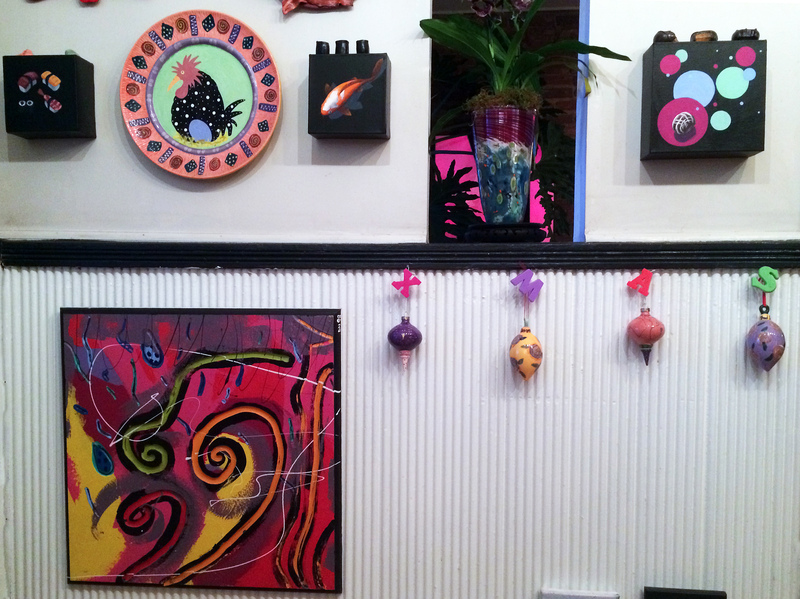 Here are a few more shots of the room. 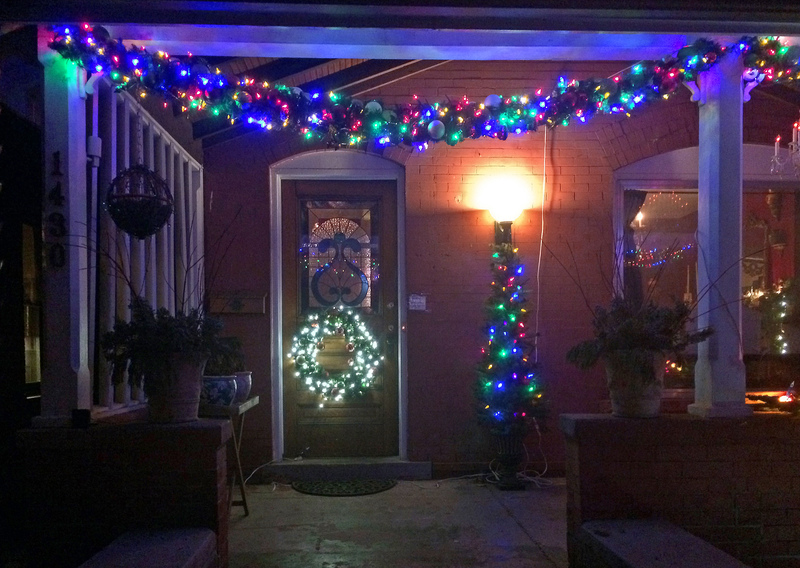 I’m very happy with it this year! 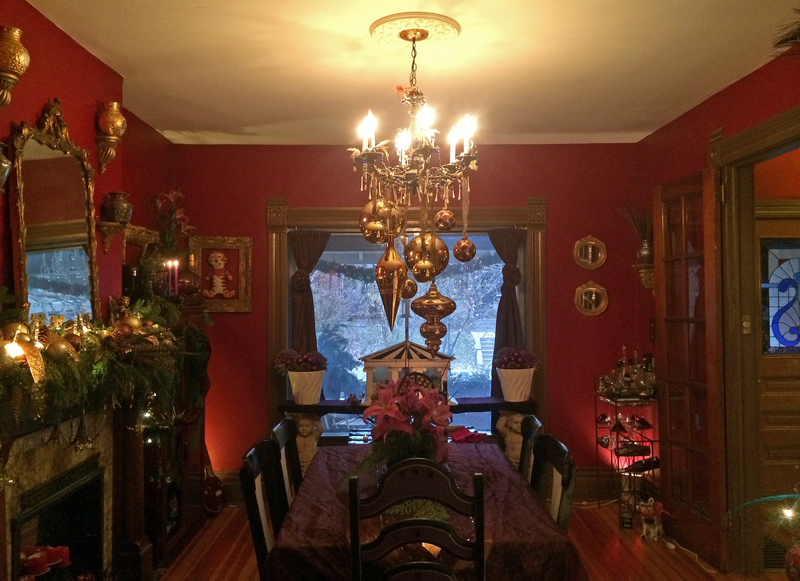 One of my favorite things, the giant gold ornaments hung from the chandelier (purchased at the thrift store a couple years ago). Looking into the main room from the living room. Next time in part 3, the funky stuff in the Other Spaces! 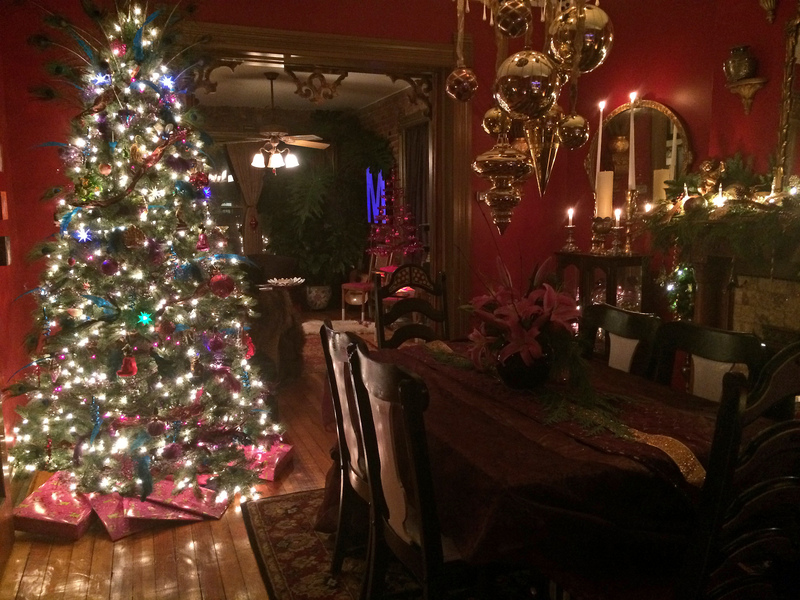 The Holiday decorating is finally done! It only took me 3 days this year 😉 I really didn’t add anything new, just a couple odds and ends I picked up at the thrift store since last season and some new glittered ribbons. I do like to change it up a bit every year, using things in different spaces and in different ways, leaving some things in storage, and finding new goodies from my “stash” of supplies to add to the mix. Moving things around is the key to keeping it fresh and fun. 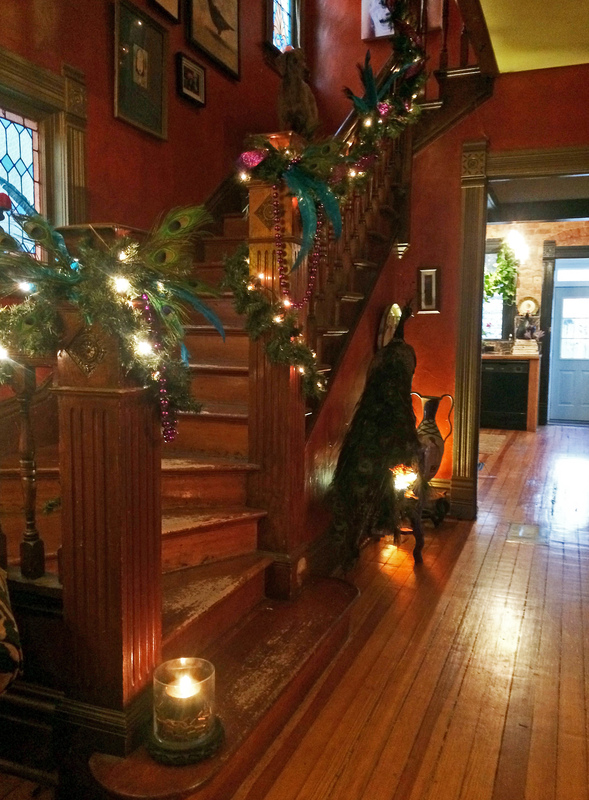 I actually toned it down considerably from last year, when I had the stairs done in ornament-packed multicolor garland (which is now outside, you’ll see it soon!) 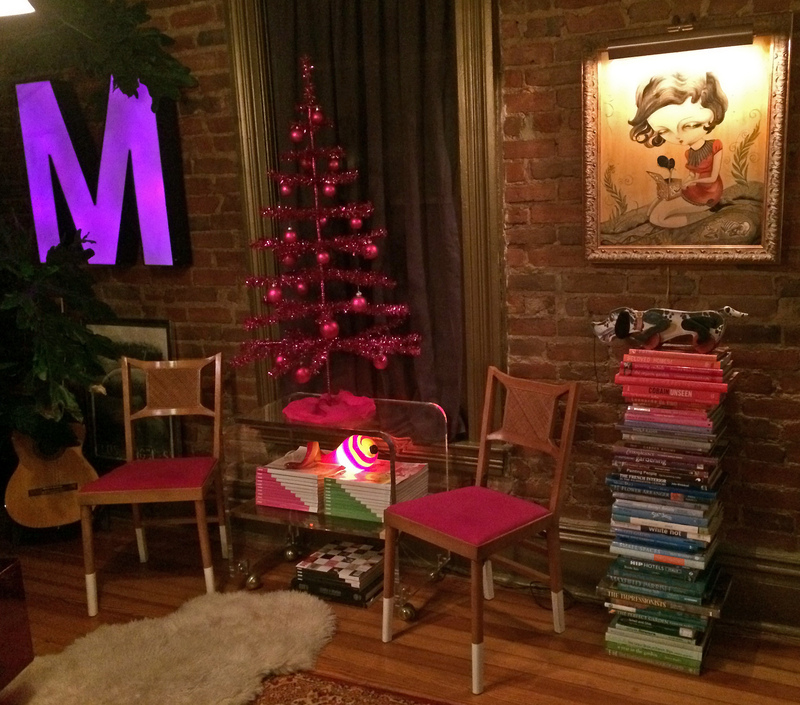 This year, I stuck with my jewel-toned decor and just made a few subtle changes. 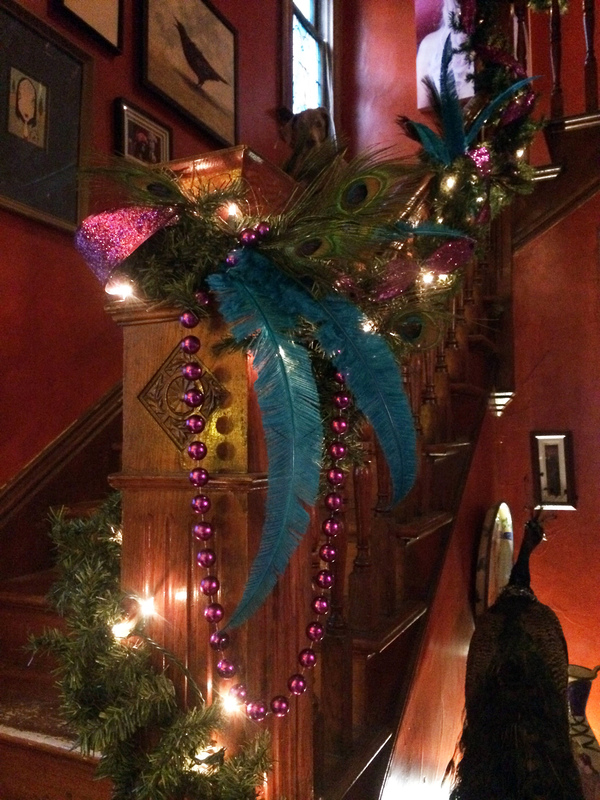 I still used my favorite decorating trick, peacock feathers (sooo cheap and what a great visual impact! Find them in bulk on Ebay), but added some dyed teal ostrich feathers left over from a big party decorating job I did a couple years ago, as well as a new wired purple glitter ribbon I fell in love with. 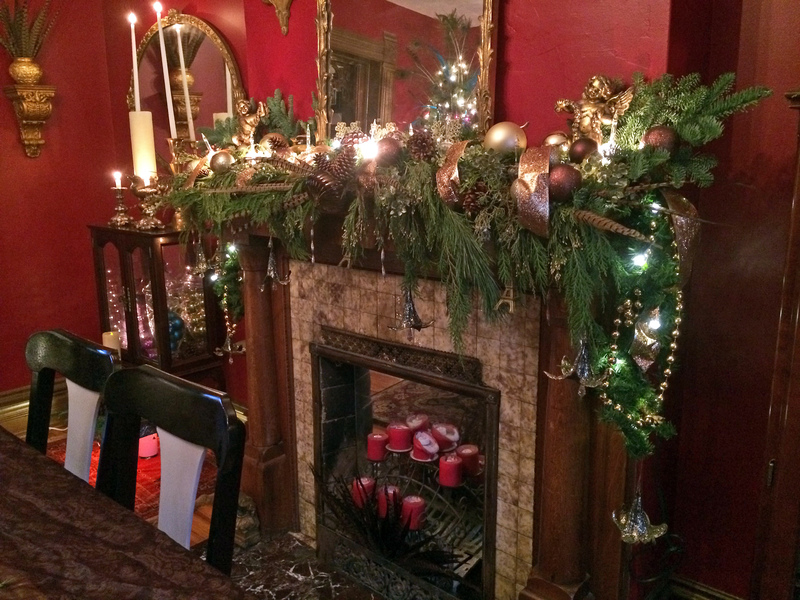 Instead of adding tons of feathers all up and down the garland like I usually do, I just used them in groupings at the newel posts and center point. They are simply tucked into the garland (this is the same garland I’ve been using for about 7 years now, purchased half-off at Target the day after Christmas.) At the bottom of the stairs I also added a couple of strings of big purple Mardi Gras beads from my supply stash that I acquired from a party years ago. The new purple glitter ribbon is simply added on top and held in place by the wired garland. 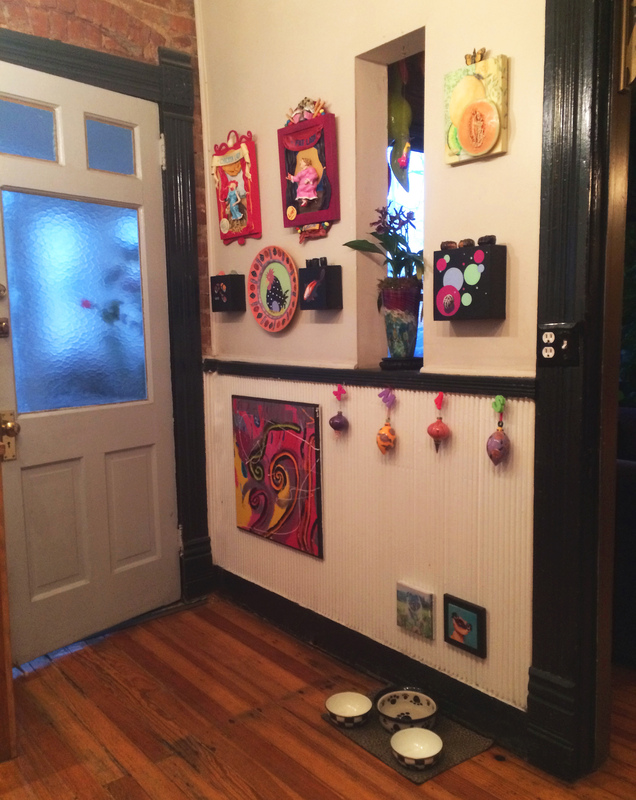 The view upon entering the front door. A closer look at the stairs. 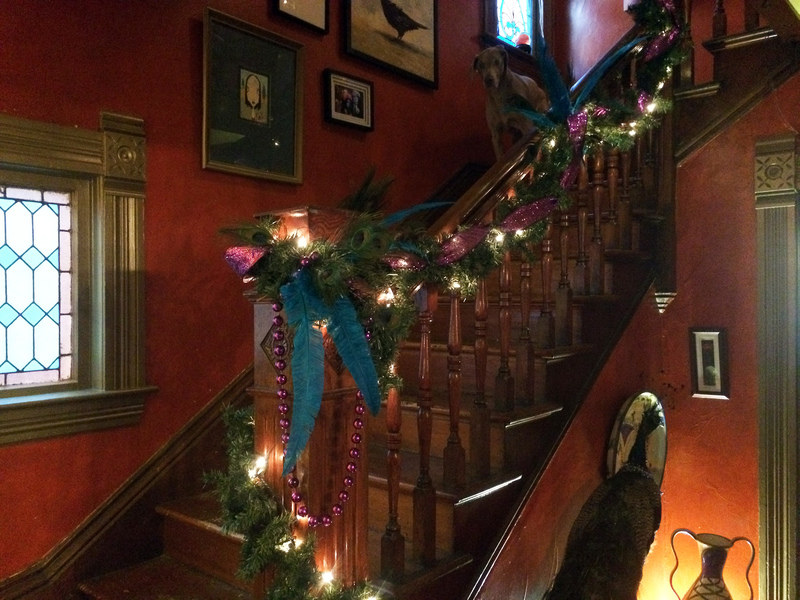 That’s one of our Dogvacay guest dogs, Cleo the Weimeraner, towards the top of the steps. Here’s a close-up of the newel post. 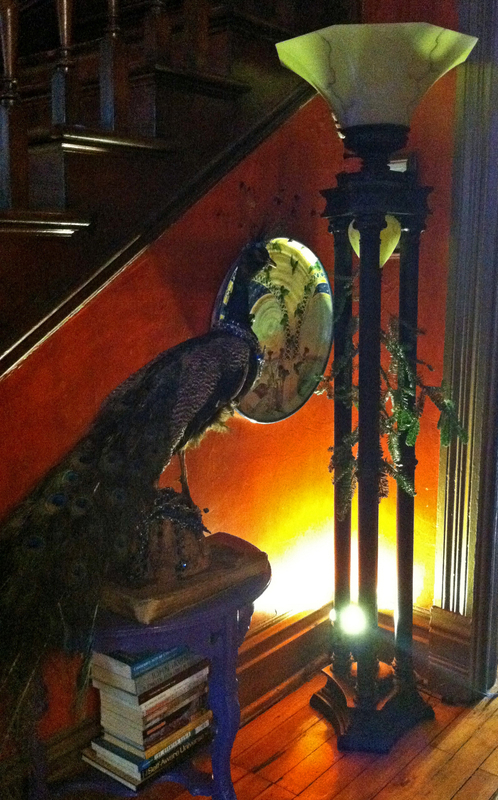 Yes, that is a taxidermy peacock “Herman” to the right, one of my most prized possessions. He “lives” there year-round. This is at the bottom of the stairs, just to the left of the front door. 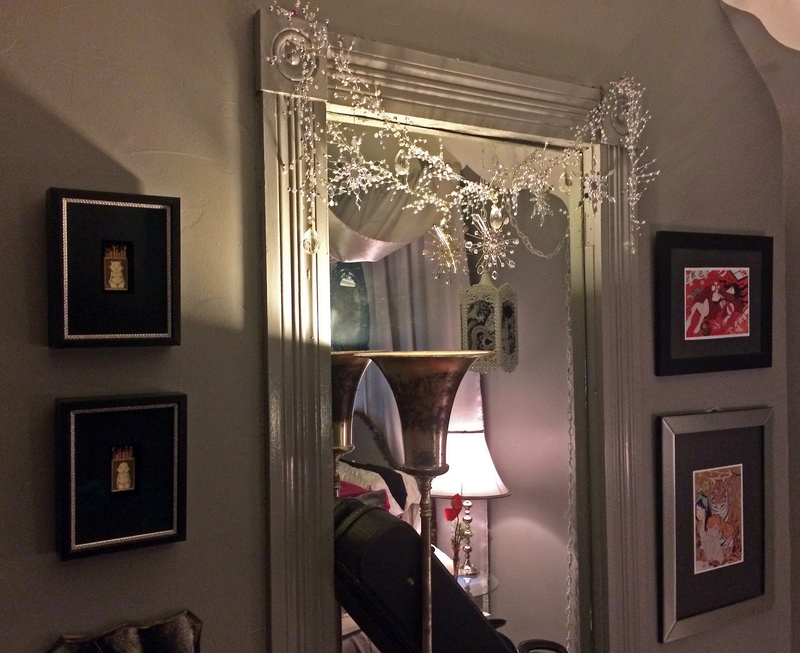 The big lamp is simply adorned with a bit of gold glittered ribbon (I used more of it in the main room) and a sprig of fresh pine. 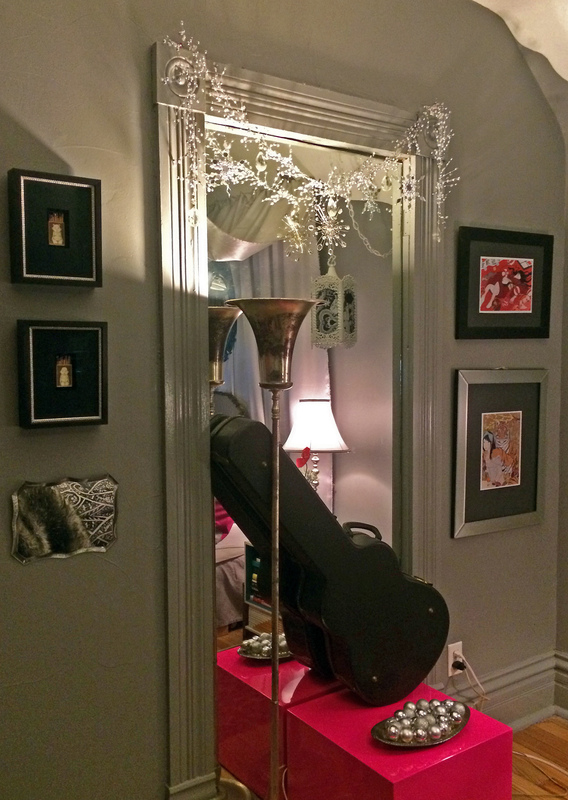 In the mirror is a “sneak-preview” of the Main Room, coming to the blog next! This post is #100! Thanks for celebrating this milestone with me. Enjoy! 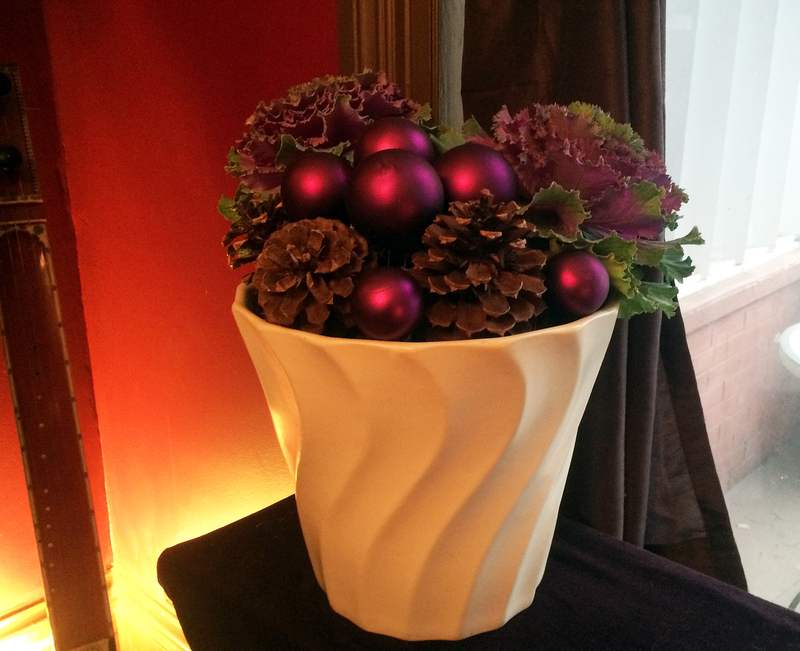 Use in flower arrangements instead of or in addition to regular greens. 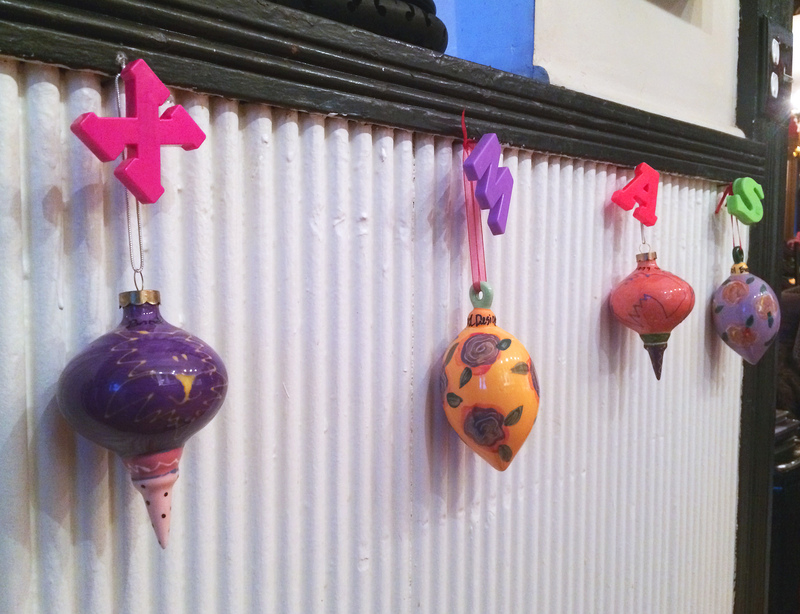 Tie a few together with a pretty ribbon and hang on your door, on the backs of dining chairs, or any vertical surface that needs some cheer. Lay a few along your dining table, bar or buffet. 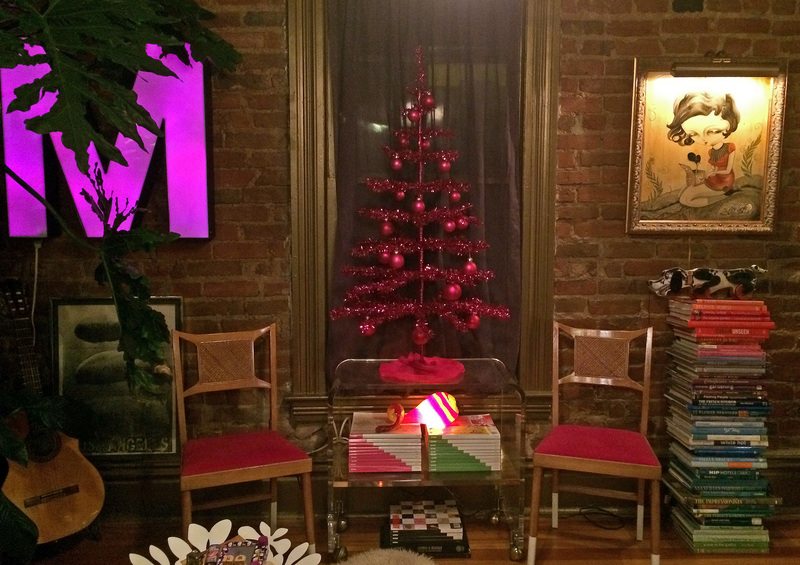 Is your holiday tree a little thin? Tuck in a few boughs to fill it out. 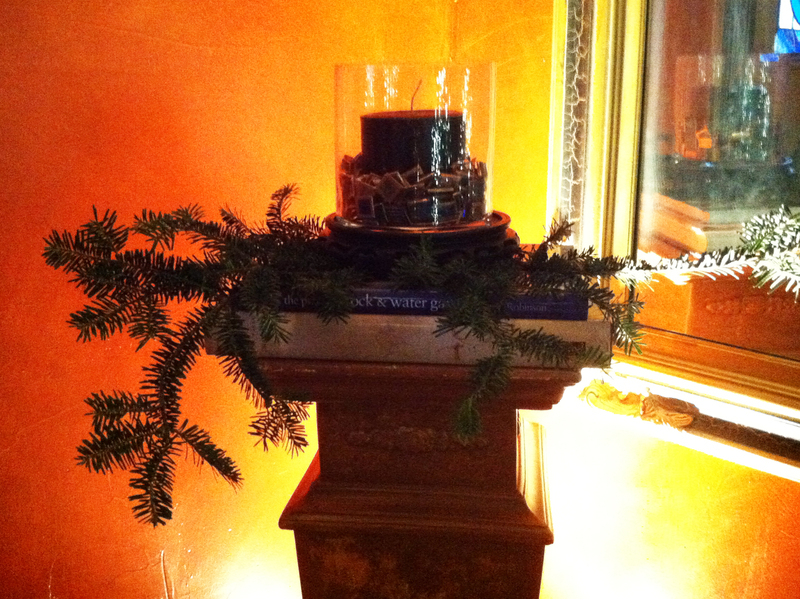 Wrap them around vases, candles, & plant pots. 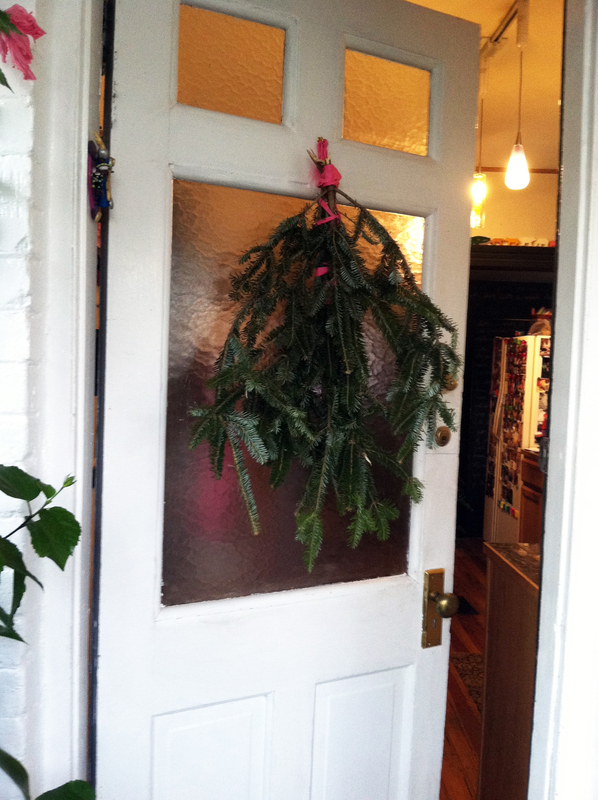 Make your own fresh wreath or garland. Weave around a chandelier (just keep it away from the sockets). 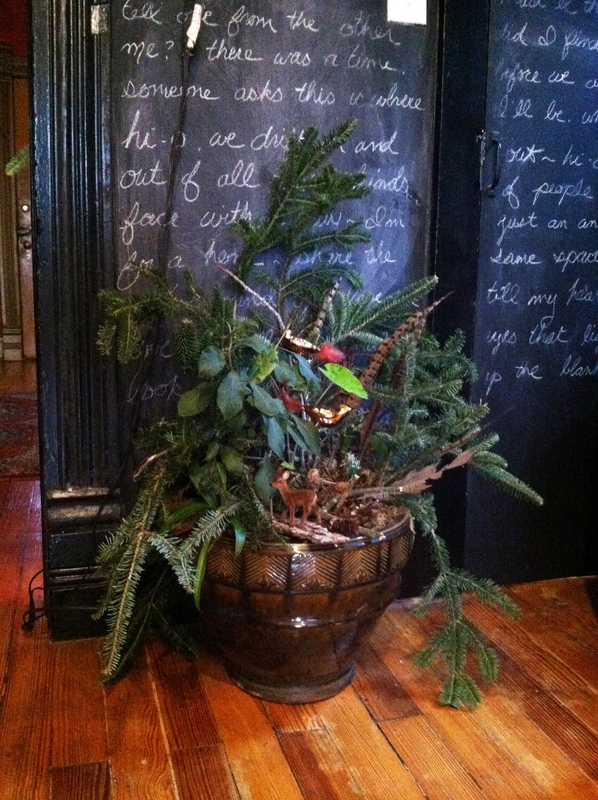 Lay along window sills with pine cones and lights. In a vase, here with some peacock feathers. Laid along the dining table. 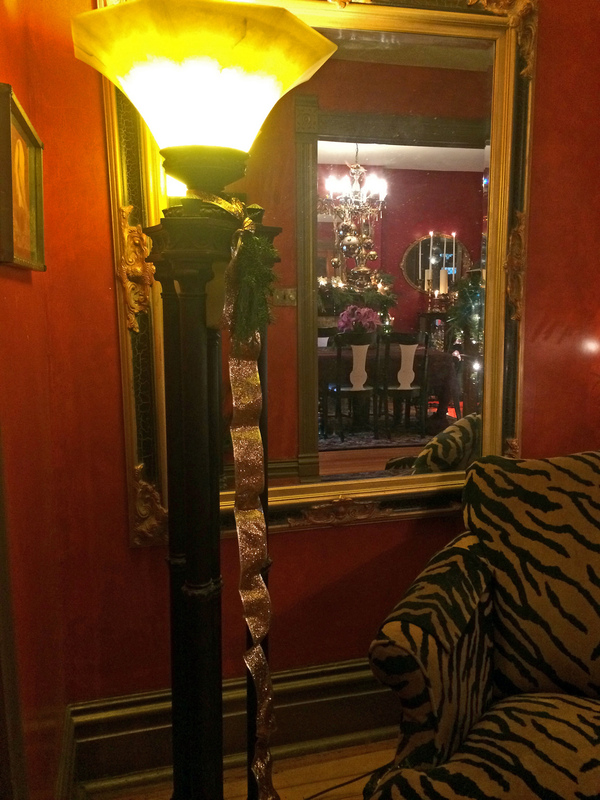 An unexpected spot, here tucked into a tall lamp. 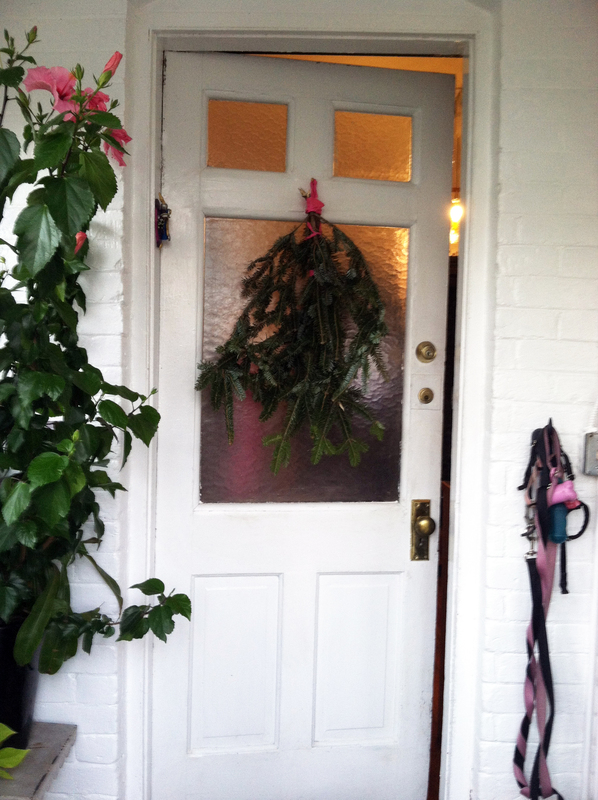 Get some boughs and get creative! Happy Holidays! 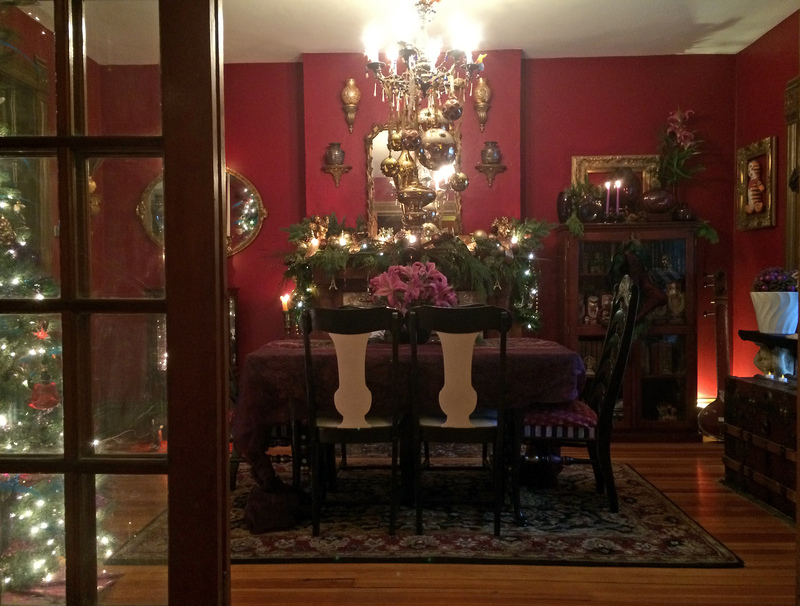 My Holiday Decor Video, as Promised.